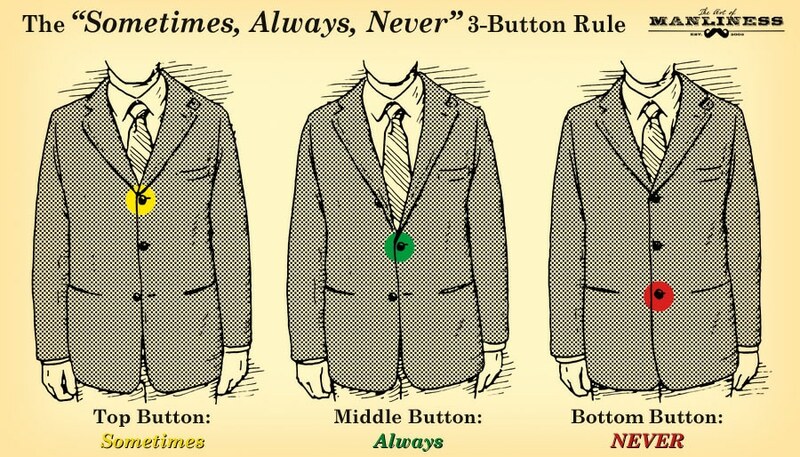 A few years ago, we published a guest post on suit buttons, and one of the best things I got out of it was a handy way to remember the right way to button a three-button suit jacket, which was shared by the first commenter. It’s called the “sometimes, always, never” button rule. Starting with the top button and working your way down: it’s sometimes appropriate to have the top button buttoned along with the middle one (a stylistic decision — if the lapel is flat, it can look good to button it; if the lapel rolls over and hides the top button, only button the middle one), it’s always appropriate to have the middle button buttoned (the middle button pulls the jacket together at your natural waist and lets the bottom naturally flare out around your hips), and you should never button the last button (doing so messes up the intended tailoring and flare offered by the middle button). Sometimes, always, never. Easy.